Mobility accounts for a full 25 percent of global energy consumption, and the majority of that is powered by carbon-based fuels. In a report earlier this year from the 2018 KPMG Global Automotive Executive Survey, nearly 80% of those interviewed agreed or partly agreed that “fuel cell electric vehicles will be the real breakthrough for electric mobility.” We couldn’t agree more. With this growing global demand for clean, convenient power, our mission is to build – and grow – a fuel cell industry that will change the face of transportation. National Hydrogen and Fuel Cell Day allows us to celebrate our milestones of the past year, which brings us ever closer to clean mobility driven by fuel cells at a global scale. The possibilities are limitless. Our recent experiences working in China are strong examples about how that work fits into and helps further define our vision, allows us to educate a market hungry for better transportation solutions, and reinforces our global leadership position. With China’s aggressive targets for the deployment of fuel cell vehicles over the next 12 years, our focus is on the abundant opportunities present in the Chinese market. By 2030, the Central China Government Roadmap is targeting the deployment of more than one million fuel cell vehicles. In May, our Chief Sales and Marketing Officer Warren Brower presented at the 8th China International New Energy Vehicle Forum (China NEV) in Shanghai. The forum focused on constructive and strategic discussions about the new energy vehicle industry; the audience was comprised of vehicle manufacturers, electric power companies, battery manufacturers, core technology providers and government officials. Presenting Nuvera’s fuel cell engine, Warren described the innovation happening within the company that is enabling the entire zero-emissions vehicle market gain momentum. 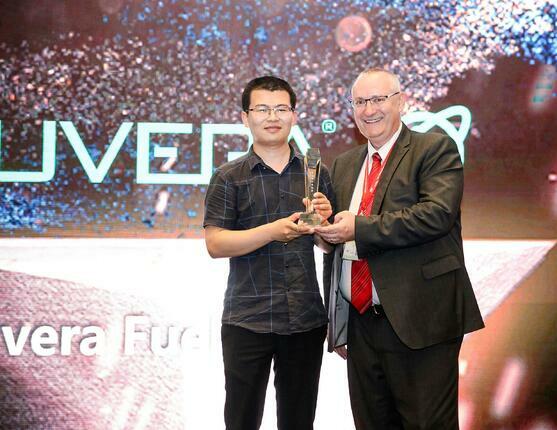 While at China NEV, Nuvera was presented with the Best Fuel Cell award, an exciting recognition of our fuel cell technology and the relationships we’ve built. In August, we announced our agreement with Zhejiang Runfeng (“Runfeng”) for the sale of fuel cell engines over the next three years. Our partnership – a significant one for the industry – gives both Nuvera and Runfeng a solid foundation for successful commercial introduction of Nuvera fuel cell products in China and, eventually, the world. This agreement and our other activity positions us as industry leaders. We were invited to become a founding council member of the International Hydrogen Fuel Cell Association. And we continue to present the potential of fuel cell vehicles on global stages, including at the 3rd International Fuel Cell Vehicle Congress in Rugao, China, where our CEO and President Jon Taylor will speak later this month. Celebrate National Hydrogen and Fuel Cell Day – the clean transportation revolution is here. Join us in being part of it.